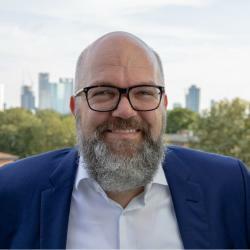 Stefan Rühle is the founder and owner of "The Digital Workforce Group AG", which is also the parent company of Talentschmiede Unternehmensberatung AG. The group's mission statement is to advance the digitalization of work and to bring technologies such as AI, Robotic Process Automation and Cloud Computing into corporate use. When I stand at panel discussions or have the opportunity to speak directly to an audience of young graduates during events, I have hardly missed an opportunity in recent years to address an important appeal to the audience. Actually, there are even several and I am therefore glad about the opportunity to offer here times one of the pieces of advice important for me: When I founded the Talentschmiede, we didn’t have a career system right from the start. I worked for a long time in corporations and, especially in my role as a manager, always found it difficult to think and work in career systems. A career system usually describes the different hierarchical levels within a company over 5-7 levels, which usually result from seniority, knowledge and competencies. From my personal experience, career systems have never been perceived as conducive, except for the short moment and state when one has experienced a promotion. After the euphoria had subsided for between three and six months, the promotion blues usually came back with a nice regularity and the question was again: When do I reach the next level, why don’t I have it yet, who is stopping me and what obstacle do I have to remove? In addition, career systems are often directly linked to salary compensation, so that one can only improve significantly if one also takes a corresponding career leap. How much energy is put by the individual, by teams, by the whole organization into dealing with the question of who can be promoted when, how and why has certainly not been measured empirically in a sustainable way, but in my personal opinion this can take on proportions that sometimes take any productivity from the individual. It even gets worse when a promotion is denied, and the person concerned falls into a productivity hole after the announcement of this decision and in the worst case is even so discouraged, angry or otherwise emotionally affected that the company is changed, and very valuable employees are lost just because a placement in a career drawer has failed. In principle, a structure in the company is of course necessary to achieve a certain order and regularity. Hierarchies are also not a bad thing per se, but from a certain size also a necessity to achieve commitment and to remain operational. But drawer systems for specialists, project managers, business analysts, etc.? I can only advise every newcomer to the profession to mentally free himself completely, especially in the first 5 years, from any panting after confirmation by artificial recognition systems such as career systems in companies. Good work and good results should always find recognition, regardless of established assessment schemes. Recognising and appreciating these achievements is one of the essential qualities of good leaders and having a good leader is far more important in career development in the early years than setting artificial benchmarks or meeting hard-to-follow criteria systems. In my personal view, career systems are a bad attempt to automate and generalize personal leadership performance. Innovative strength needs characters, not individuals who are connected in the same way. Characters, on the other hand, need personal support and not intranet-based dialogue systems with assessment programs. So please forget all your ambitions to make a career in systems. You can still make a career when everything else hasn’t worked and you have nothing else left to do. Until then, please try to stay individuals with your own way, your own opinion and your own goal. And if that doesn’t match your employer’s, you’ll have to change employers. Or start your own business. Or become more self-employed. There are so many successful ways to stay true to yourself and be successful in the process. There is no need for a career system.